The negotiations are expected to wrap up tomorrow, but several key issues are yet to be resolved. Chief Bill Erasmus of the Dene nation, Northern Canada, stands in front of a two-story-high, mechanically operated polar bear outside the conference venue. SLEEP-STARVED ENVOYS tasked with saving mankind from catastrophic climate change aim to wrap up a historic Paris accord tomorrow after battling through a second all-night session of UN talks, the French hosts have said. Eleven days of bruising international diplomacy in the French capital appeared to finally open the door to an elusive deal, now expected to be delivered one day after the original Friday evening deadline. Releasing a fresh draft of the pact last night that showed progress on some key issues, Foreign Minister Laurent Fabius said a deal was “extremely close”. World leaders have described the Paris talks as the last chance to avert disastrous climate change: increasingly severe drought, floods and storms, as well as rising seas that engulf islands and populated coastal regions. The planned accord would seek to revolutionise the world’s energy system by cutting back or potentially eliminating the burning of coal, oil and gas, which leads to the release of Earth-warming greenhouse gases. UN efforts dating back to the 1990s have failed to reach a truly universal pact to contain climate change. Developing nations have insisted established economic powerhouses must shoulder the lion’s share of responsibility as they have emitted most of the greenhouse gases since the Industrial Revolution. But the United States and other rich nations say emerging giants must also do more, arguing that developing countries now account for most of today’s emissions and thus will be largely responsible for future warming. They are arguments worth hundreds of billions of dollars, which still need to be resolved before the negotiators can leave Paris. Among the most striking developments in the latest draft of the agreement is wording that seeks to resolve a dispute over what temperature limit target to set. However several big polluters, such as China and India, had preferred a ceiling of 2C, which would allow them to burn fossil fuels for longer. The latest draft offers a compromise that states the purpose of the agreement is to hold temperatures to well below 2C, but to aim for 1.5C. But everyone at the talks was fully aware that the toughest issues, primarily over money, are still to be confronted. Rich countries promised six years ago in Copenhagen to muster $100 billion (92 billion euros) a year from 2020 to help developing nations make the costly shift to clean energy, and to cope with the impact of global warming. But how the pledged funds will be raised remains unclear – and developing countries are determined to secure a commitment for increasing amounts of money after 2020. The latest text refers to the $100 billion as a floor, potentially triggering a last-minute backlash from the US and other developed nations. Another remaining flashpoint issue is how to compensate developing nations that will be worst hit by climate change but are least to blame for it. The developing nations are demanding “loss and damage” provisions, which Washington is particularly wary of as it fears they could make US companies vulnerable to legal challenges for compensation. Most nations submitted to the UN before the conference their voluntary plans to curb greenhouse gas emissions from 2020, a process that was widely hailed as an important platform for success. But scientists say that, even if the cuts were fulfilled, they would still put Earth on track for warming of at least 2.7C. Negotiators also remain divided over when and how often to review national plans so that they can be “scaled up” with pledges for deeper emissions cuts. 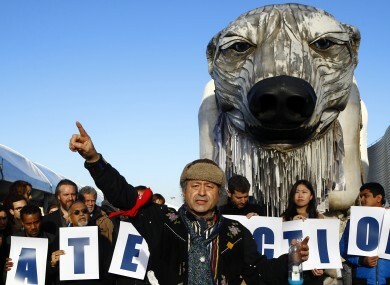 Email “Giant polar bear among protesters at Paris climate talks”. Feedback on “Giant polar bear among protesters at Paris climate talks”.